Colorful intersection repair is one example of how citizens are using tactical urbanism to improve cities and make them more human-centered. Photo by Greg Raisman/Flickr. Like many DIY, post-recession movements that have sprung up in the past few years, tactical urbanism is human-centered and empowering. At its core, it’s about people making the city work for them. Rather than relying on governmental actors, the tactical urbanism movement empowers individual citizens to make their streets, their neighborhoods, their cities the places they want them to be. Projects—like installing street signs more useful than the official ones—are typically low-budget, informal, and east to implement, allowing people to become actively engaged in civic life in a way that yields fast, concrete results. Uneven Growth, a current exhibition at New York’s Museum of Modern Art (MoMA), explores the potential of tactical urbanism at the global level. Bringing together thought leaders and practitioners from Hong Kong, Istanbul, Lagos, Mumbai, New York, and Rio de Janeiro, the exhibition examines how the citizen-driven movement is changing conventional relationships between people, public space, housing, and natural environments. Although the exhibition’s proposed solutions have been criticized for having lofty, unrealistic ambitions, Uneven Growth‘s online platform retains the movement’s original DIY ethos, as users everywhere can submit examples of tactical urbanism from their own communities. 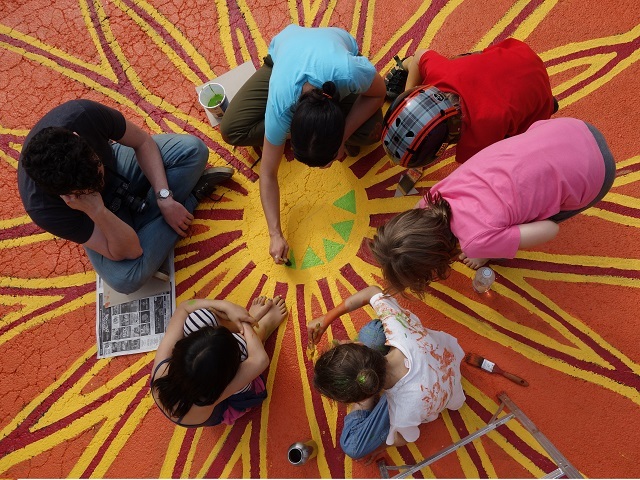 Tactical urbanism encompasses a wide spectrum of projects that are shaped in the unique contexts of our cities and communities. They often emerge in very different circumstances and for very different reasons. Some are completely individual and grassroots; others are inspired in collaboration with local non-profits. Here are four examples from the Uneven Growth exhibition that stood out to us and represent the diverse range of forms tactical urbanism can take. This making-of video shows how the Frida Project was built and how this “car” makes Quito’s streets brighter, more enjoyable places. Video from YouTube. Many cities are currently grappling with rising rates of car ownership and over-dependency on private vehicles. Quito is something of an exception. Only 26 percent of residents use private cars as their primary mode of transport. The Frida Project takes advantage of this to reimagine the city’s streets as collective public spaces for people, not cars. Built with recycled materials and unskilled labor, “Frida” radically plays with our concept of what a vehicle is by substituting chairs and a communal table for an isolated transport experience. Frida is structured in the rough shape of a car, but transforms parking spots into human-centered public spaces—sort of like a mobile parklet. As Frida’s creators note, “This car does not take you long distances, but instead takes in ideas, dreams, and relationships. Where it parks, instead of occupying space it provides a place for citizens.” After all, tactical urbanism often aims to challenge the impersonality of traditional design and make the city work for people. Start the video at 1:45 to see residents of Istanbul’s Beyoglu District stop and check out the Kopfkino project. Video from Vimeo. As many people increasingly rely on data-driven apps and platforms like Google Maps to navigate their cities, some skeptics have worried that our streets are losing their traditional element of chance, surprise, and mystery. Kopfkino (roughly, “head theater” in German) is a project to revitalize those aspects of the urban experience. Using a shopping cart as their base, a group of friends in Istanbul built a portable projector that casts users’ faces onto building facades when they peer into a laptop camera. Kopfkino invites the curious passerby to pause from his or her regular routine and discover a new experience in a familiar place. DIY projects in public spaces like Kopfkino are popping up all over Turkey. However, unlike some other examples of tactical urbanism, Kopfkino likely wasn’t intended to be replicable or scalable. The point, however, is to challenge what it means to encounter other people in public space, and to revisit the idea that every city offers an individual and unique experience. 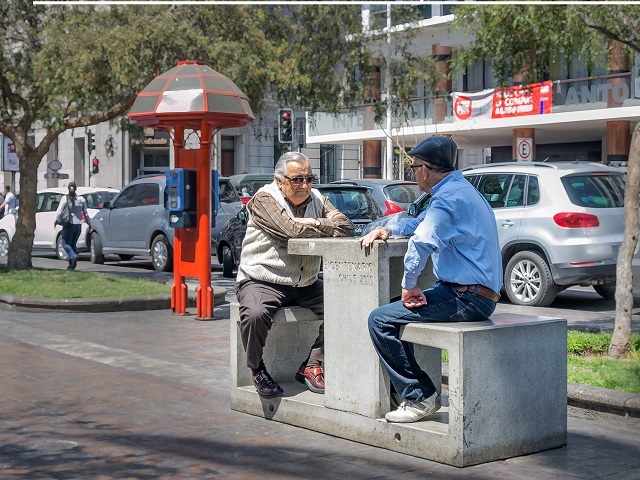 Two men sit at a makeshift concrete table in Antofagasta, Chile, where tactical urbanism is a growing trend. Photo by Pablo Guerra/Flickr. Situated on the Pacific coast in the far northern deserts of Chile, Antofagasta isn’t naturally brimming with green spaces. However, Ciudad Emergente—a Latin American non-profit that promotes tactical urbanism as a form of public participation—organized a community bike ride for collective tree planting earlier this year in order to raise awareness about the potential of urban greenery. Along the route, gray-water recycling workshops taught participants about irrigation and bottom-up maintenance. Ciudad Emergente aims to empower neighborhood residents to take control of their public spaces, and to show how urban greenery can be about much more than top-down city beautification. 120 volunteers from China and Japan helped put up temporary classrooms made of paper tubes after an earthquake destroyed Hualin Elementary School in May 2008. Photo by 準建築人手札網站 Forgemind ArchiMedia/Flickr. After the Sichuan earthquake of May 2008 devastated an elementary school in Chengdu, the local education bureau needed a quick way to get students back in a stable learning environment. 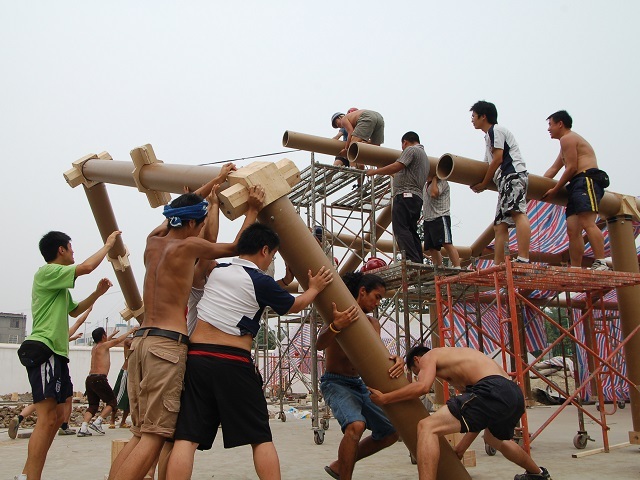 In a collaborative partnership between Shigeru Ban Architects from Japan and Chengdu’s community leaders, 120 Japanese and Chinese volunteers came together to design and construct temporary classrooms entirely out of paper tubes. By opting for cheap, recyclable, reusable, and readily available paper, the volunteers were able to build nine classrooms in about forty days. Novel projects like this demonstrate how the flexible, responsive nature of tactical urbanism can provide effective disaster relief to cities in times of need. Are tactical urbanism projects picking up steam where you live? Let us know in the comments!